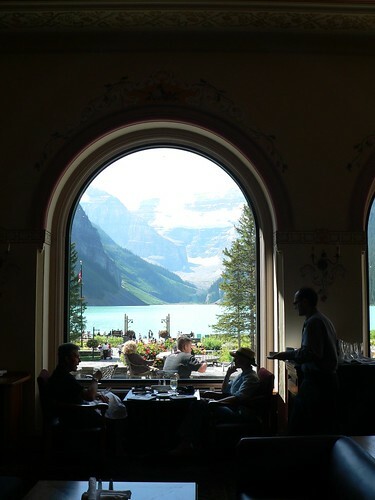 This previous summer, I had a chance to realize one of my long-held dreams, which was to visit Lake Louise and its low-key spectacular hotel. Just in case I win the lottery or come into money from a relative I've never heard of, I decided to apply for the Fairmont Hotel card, so that the next time (I'm considering converting to Hinduism to ensure there's a next time, even if it's not in my current time) we go to Lake Louise, I'll be able to get a special rate. Well, Folks, the application only cost you the amount of time it takes to fill out, so if you feel like doing something that will keep your change in your pocket and yet give you a (perhaps false) sense of grandiosity, I suggest you get yourself one of these cards. Why bother with another piece of plastic that you may never use? Well, scroll down about half-way on the application and highlight the category "Title". I've filled enough card applications in my lifetime such that filling another one is automaton-ish. Same old..same old. Well, Fairmont Hotel's stopped me in my tracks. Who would have thought that I could title myself Prince, Archbishop, Viscount, Sultan, Prime Minister, Maestro, even Yg Di Pertuan Agung? I settled on "Count" as there's a barely tenuous grip my surname has on a self-annointed royal family back in the Old Country. My father, as a joke and as a term of endearment by his friends was nicknamed "Grof", Croatian for "Count". With his sense of self-inflicted humor, he was laughing somewhere as I hovered my mouse over and then clicked on "Count". Can't wait to receive the plastic acknowledgement of my royal standing. "Fairmont Chateau Lake Louise? Yes, please make a reservation for 2 for Count Darko....."
Be careful what you sign up for! I'm thinking of one of the rare times when an interview with Bono was worth the paper: the interviewer asked where he picked up the name, and Bono explained how his gang used to play a great deal with nicknames. "I think it started with royal titles. We were calling each other 'Duke This & That,' and all sorts of things." Interviewer: "How about Count? I could imagine your friends greeting you as a Count." Bono: "Well, 'Count' comes pretty close to it, all right...."
Puts me in mind of an old post that Bearded(?) had on the different attitude that the Brits have toward the "c-word" but it looks like that may be yet another of his decompositions. Alas.